"This collaboration pairs traditional Bavarian pilsner style with a handful of summer’s most memorable flavors. Pilsner and Munich malt. Nugget, Pacifica, and Mandarina Bavarian hops. Add juniper berry & citrus peel. Our first release is aged in tequila barrels and our second is aged in Bully Boy rum barrels. A refreshing pour either way. Our first collab is with Doug MacNair, a friend from Harpoon. He arrived there by way of Germany, Washington, and New Hampshire. We thought Weymouth would round out his list. Glad he agreed." 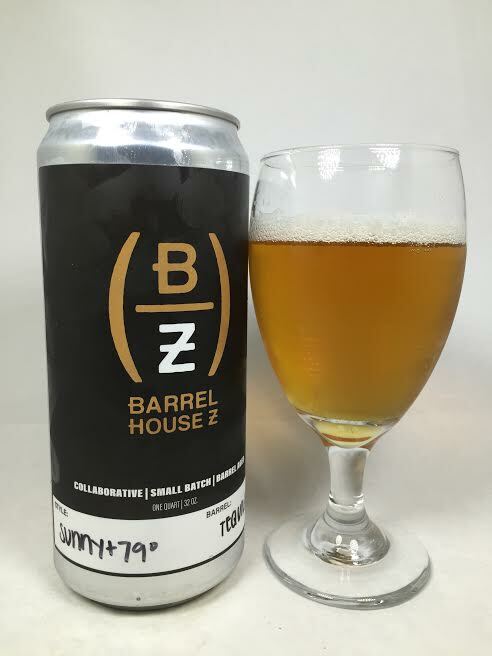 Barrel House Z is the newest brewery on the South Shore (possibly even all of Massachusetts) and their overall theme is barrel-aging. They are barrel-aging all styles in multiple spirit barrels which is a truly unique concept. I've heard about other breweries who are also doing the same thing, but there is NOTHING like this in Massachusetts. Barrel House Z in Weymouth, MA has only been open a couple of weeks for growler and crowler sales, but their tap room is scheduled for opening by the end of Summer. Their first public release is their Pilsner "Sunny & 79" and the first version is aged in tequila barrels. Pours a slightly dark yellow with a transparent body. The photo doesn't show it, but this had a fluffy, white three-finger head when poured, but it obviously disappeared in a flash. The aroma has strong tequila flavor, but with no alcohol at all. There's even some lime and salt for good measure with some ginger. The base pilsner is hard to detect due to the overpowering (in a good way) barrel presence. The base beer is coming through more on the taste, but that barrel still holds the majority of the flavor on this one. Good tequila-aging has been hard to come by for me, but this beer did it right. The tequila is not hot or full of alcohol burn and you are left with rich, smooth, top-shelf tequila. Elements of the barrel are adding influences of oak and wood with just the smallest bit of vanilla buried in the background. As for the pilsner itself, the doughy malts are noticeable right away. This seems well-hopped too as I am getting a decent amount of spicy, oily hops which work well with the tequila and there's even a refreshing citrus zest kick at the end. Mouthfeel is light and crisp with no alcohol presence. At 8%, you don't even get a warming sensation and this is actually pretty easy (even dangerously) easy to drink. Since the tequila added all flavor and no alcohol sting, it just adds to an already easy-to-drink, light Pilsner. The mouthfeel is a little undercarbonated, but it's not flat. This first offering from one of the newest (and most unique) breweries in Massachusetts is a home run. I'm not typically a fan of any sort of Pilsner, but barrel-aging one appears to have gotten me to reconsider. I would never think aging this style would work, but the Tequila was an excellent choice and it kept the base beer highly drinkable while adding tons of flavor. The direction the brewery has chosen to go in is different from anything else in the area, and if this is a sign of things to come, then I am on board for the ride.